At 0°. Hakuna Matata Kenya! “You know you’re far from home if you can climb the poinsettia.” This is what Dr. Joe Mamlin told us as we passed the poinsettia tree at the Mosoriot clinic a few weeks ago. Dr. Mamlin’s words couldn’t be truer. After all, the poinsettias come as little potted plants in the U.S. rather than a several foot tall tree. Six weeks into my time here in Eldoret, it’s clear that I’m far from home when we see zebras and baboons casually grazing on the side of the road as we drive past the Equator. From attending a Chama cha MamaToto meeting (as previously described in my last blog post) to going to the Tumaini Innovation Center and going on rounds with the Medicine, Pediatrics and Surgery team leaders at the Moi Teaching and Referral Hospital, it seems like we’ve been here longer than six weeks. With our first two weeks in Eldoret being devoted to learning more about AMPATH, the last four weeks thus far have been focused more on individual projects. During this time, I have had the opportunity to become more acquainted with AMPATH Surgery and work with surgery team lead Dr. Connie Keung on several different surgery-related projects. Me, scrubbed in and standing next to Kenyan senior surgical resident Dr. Chacha post-operation. One of the projects that I have been working on is an ethics based project for how to operate surgical camps. If you are not familiar with the term ‘surgical camps’ it is where a group of professionals go to a different country or region for a short period of time to provide specific surgical services to a population where there is usually a need for such services. There isn’t really defined terminology when it comes to these camps so you may have heard of ‘Short Term Medical Missions’ as an alternate way of referring to these camps. What’s interesting to note is that there aren’t any overseeing boards or regulations on these camps, making them inconsistent across the board throughout the world. The way one group runs their camp can be, and often is different from the way another group runs theirs. What we are trying to do at AMPATH is to develop a guideline or checklist to standardize the camps that work with AMPATH to make the members of the camp more like “remote long-term partners” versus the approach where some camps can come and go without leaving sustainable infrastructure while also burdening the host institution. In short, due to this project, I will be spending time in Migori, Kenya for the next week with Kenya Relief at an ENT surgical camp. Hopefully, I will gain some insight into how surgical camps are run in Kenya and be able to share my experiences in a blog in the future! Apart from this ethics-based project, I’ve also been assisting in setting up the first Advanced Trauma Life Support (ATLS) class here in Western Kenya. It is very exciting to be bringing this training to physicians in this part of the country because I can imagine this training will ultimately help physicians manage acute trauma cases and perhaps save numerous lives in the process. The ATLS class is to take place at the Moi Teaching and Referral Hospital (MTRH) here in Eldoret from July 18-20, but until then I’ve been helping with gathering all the necessary supplies and testing the simulations. With many of the materials that could be easily found in the U.S. being rather hard or impossible to find in Eldoret, it’s been an interesting scavenger hunt/craft time process. For example, instead of using a human mannequin with ribs for teaching how to insert a chest tube, I was tasked with finding a suitable replacement that would also be affordable so that future ATLS classes could create them without much difficulty. However, it has been pretty hard trying to explain to the butcher what cut of goat meat or pork meat I wanted (a certain size of meat with the rib bones) but I was eventually able to explain what I wanted by a lot of hand movements and use of synonyms (not knowing Kiswahili can sometimes prove to be difficult here). Also, with there not really being street names or maps here, I’ve learned that you can’t go anywhere unless you know someone who knows where that place is located. 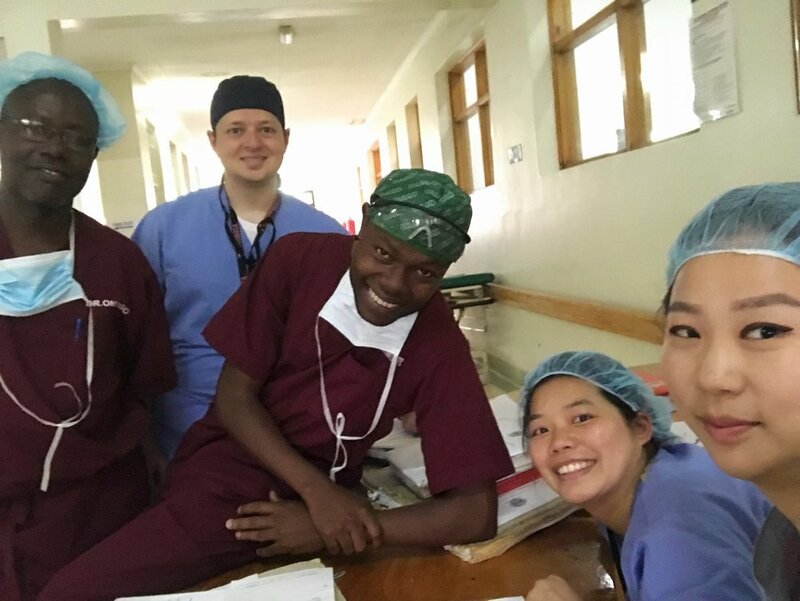 Dr. Connie Keung (AMPATH Surgery Team Lead) and Dr. Kyle Carpenter (Global Surgery Fellow and IU Surgery Resident) conducting a surgery in conjunction with Kenyan surgical counterparts in Eldoret, Kenya. Other than my research projects, I’ve also spent extensive time rounding with Dr. Keung in the surgery ward and at surgery clinic, seeing patients who either need a surgery or are following up on a past surgery. Seeing the number of people with diseases or illnesses that are not terribly common in the U.S. has been crazy and definitely a learning experience. For some reason, one of the most common forms of gastrointestinal obstructions found here is the sigmoid volvulus where for some reason; many Kenyans have a redundant sigmoid colon, causing the sigmoid colon to wrap around itself. Additionally, there seem to be a large number of hepatobiliary related illnesses and a lot of ascites (abnormal accumulation of fluid in the abdominal cavity). It has been an amazing experience being able to see patients in the wards and then see them in the surgical theatre (operating room). Being able to scrub in on surgeries has given me the opportunity to be more involved and see the inside of the human body at greater detail than before. I can definitely say being in the operating room is different from anatomy lab, especially when I can see the peristalsis of the intestine in action or really, all the blood versus preservative. I also found it rewarding to be able to scrub in on surgeries like a partial thyroidectomy and a modified radial mastectomy and then see those patients in the ward, free of the afflicted organ or part. It made me see how amazing surgery is and how lives can be changed in a matter of hours. A person can go from having a cyst the size of three babies in their abdomen to cyst-free thanks to surgical intervention. Cases like this make it more apparent to me that there is an increasing need for universal access to safe and affordable surgical and anesthetic care to save lives and stimulate growth with communities around the world. A Team Surgery selfie at the Moi Teaching & Referral Hospital Theatre. Global surgery is a growing field within global health and it has certainly been exciting seeing it up close and in-person. Spending time with AMPATH Surgery has showed me that a lack of affordable and accessible surgical care prevents people from flourishing and living to their potential because no matter where you are or how far you are from home, ultimately we are all human, striving to live healthy lives. 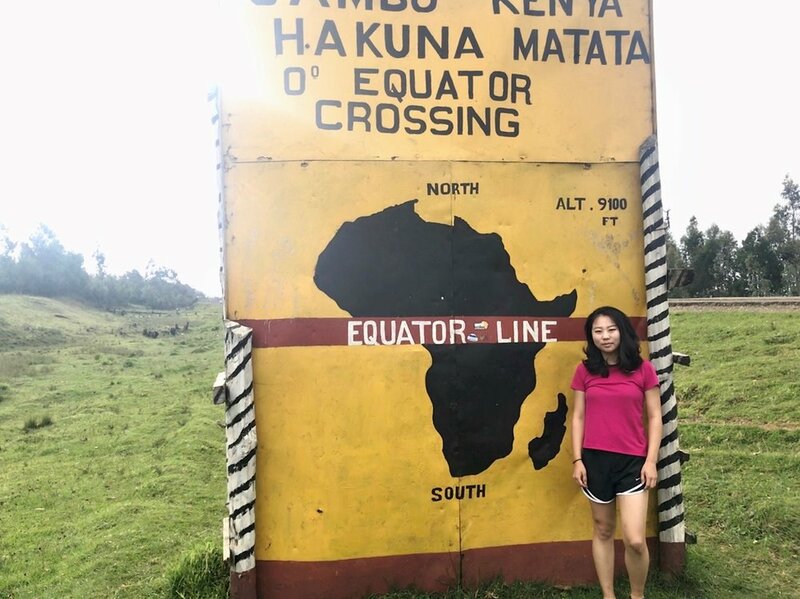 Diane Choi is a second year medical student at the IU School of Medicine and a 2018 Slemenda Scholar spending two months in Eldoret, Kenya with AMPATH. Her global health experience stems from collaborating extensively with researchers around the world including Belize and Thailand on spatial repellent research and vector control as a whole.